Coun Marc Jones, Lincolnshire Police and Crime Commissioner, with Prime Minister David Cameron. 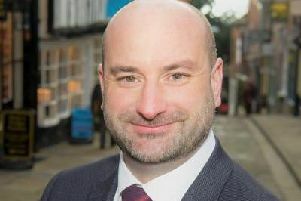 Lincolnshire Police and Crime Commissioner (PCC) Coun Marc Jones has dismissed criticism of his appointment of a deputy, despite reservations from those overseeing his work. Coun Marc Jones claimed it was “totally and quite properly” his right to go ahead and appoint fellow Lincolnshire County Council member Coun Stuart Tweedale to the part-time, £18,000-year post. A county councillor for Ruskington and Cranwell, Coun Tweedale was appointed last Wednesday in spite of the 12-strong Lincolnshire Police and Crime Panel (PCP) deciding that “it isn’t able” to recommend him as Deputy PCC. Coun Jones said: “The legislation says that the panel should be involved in the selection of the deputy, but I was clear before the election about my intention to appoint one. “The panel had no choice but to look at the very narrow criteria laid out in the legislation whereas I took into account everything, including the knowledge that I have to work with the Deputy PCC on a daily basis and that he is a representative of me. Coun Jones’ appointment of his Deputy PCC came under attack from two of his rivals for the post of PCC at last month’s election. Ms Preston said: “I’m extremely disappointed that Marc Jones has chosen to ignore the recommendations of the Police and Crime Panel and has appointed Stuart Tweedale as his deputy. But Coun Jones said: “The panel wasn’t holding a job interval but merely looking at some very specific parts of criteria laid down in the legislation. Coun Jones went on to reveal that both he and his deputy had “stepped down” from their executive responsibilities at Lincolnshire County Council and the Commissioner himself will stand down as a county councillor for Lincoln Bracebridge before elections due next year.